The three-time grand slam winner had hinted at retirement before going out of the Australian Open in the first round in January as he struggled to deal with ongoing pain from a long-standing hip problem. "I want to continue playing," Murray told reporters at Queen's Club during an appearance to officially confirm an endorsement deal with Liverpool-based sports brand Castore. "I said that in Australia. The issue is I don't know whether it is possible. "I am a lot happier than I was certainly two months before the operation," he added, referring to the hip resurfacing surgery he underwent in January. "I have no pain in my hip any more. I was in pain for a long time. "The rehab is slow and it's been going pretty well and I just need to wait and see how things progress. If it's possible, I would certainly love to compete again." Doubles player Bob Bryan is one player who returned to competitive tennis after undergoing hip resurfacing surgery. Speaking to CNN, Murray explained that he had nothing to prove, but wanted to prolong his career for his own pleasure. "I want to try and see if it's something I'm able to do," he said. "It brings me happiness and I enjoy it a lot. "If I'm able to, I will try. It's not about proving anything to anybody or trying to achieve a certain result or try and win Wimbledon again. It's not about that. It's about doing something that I love doing and not being in pain whilst I'm doing it." He added that, as well as the constant pain caused by his hip, he had fought an ongoing mental battle as he sought to keep the issue away from the public eye. "The thing that was hard for me was that, as an athlete, when you have a problem, you are always trying to keep it from your competitors and you're trying to be optimistic and tell people that things are good," he said. "That [press conference] was the first time that I had told everybody that had been asking me for a long time, that this had been really really hard, and I was struggling and it had built up into something." If he does complete his recovery -- a situation that seemed unlikely when he spoke tearfully in Melbourne before his first-round loss, he would become the first professional singles player to play with a metal hip. 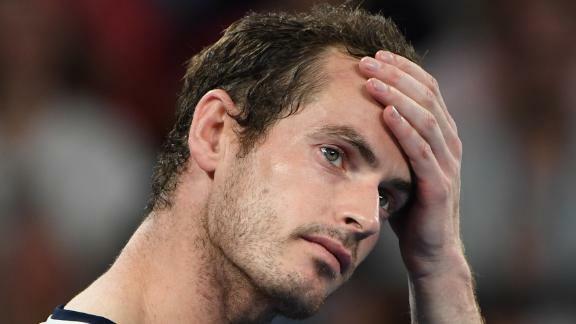 Murray was beaten in five sets by Roberto Bautista Agut at Melbourne Park before receiving a standing ovation from the crowd.